Breast cancer screening is effective and the benefits outweigh potential risks, experts at the International Agency for Research on Cancer (IARC) have said. The study, published in the New England Journal of Medicine, provides an update of the 2002 IARC Handbook on Breast Cancer Screening in light of recent improvements in treatment and new data on screening practices. The experts said there is sufficient evidence to support mammography screening, as it is effective in reducing breast cancer mortality for women aged 50–69 years, and that the benefit of reduced mortality extends to women screened at age 70–74 years. However, evidence for the effectiveness of screening women aged 40–49 was considered limited. Researchers looked at data from 20 cohort and 20 case–control studies conducted in high-income countries in Australia, Europe and North America. It showed that women aged 50–69 who attended mammography screening had a reduction in breast cancer mortality of about 40%. Several studies showed that mammography screening of women aged 70–74 years also results in an important reduction in their breast cancer mortality. There is sufficient evidence of an increased risk of radiation-induced breast cancer from mammography screening in women aged 50 years or older; however, this risk is substantially outweighed by the reduction in breast cancer mortality. Dr Béatrice Lauby-Secretan, an IARC scientist and Responsible Officer for the Handbooks Series, said: “Careful consideration of both the benefits and harms of mammography screening shows a net benefit from inviting women 50–69 years old. The panel also reported on the use of breast cancer screening by physical examination. 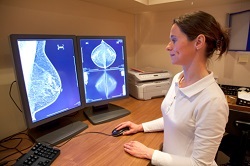 Here, they said that clinical breast examination is associated with the detection of smaller and earlier-stage tumours. However, no data were yet available for an evaluation of the effect of this screening technique on breast cancer mortality.